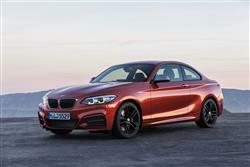 BMW's 2 Series coupe has been lightly refreshed. Jonathan Crouch checks out the revised range. BMW coupes used to be all about compactness, lightness and rapid responses. The 2 Series coupe still answers the call and now gets a minor refresh to build upon recent changes made to its petrol engine rosta. At the top of the line-up, the 370bhp M2 variant remains but you don't need one of those to get really satisfying performance, thanks to revitalised 2.0-litre and 3.0-litre petrol models further down the range. For as long as many of us care to remember, if you wanted a well-built coupe that was fun to drive, the path was well-worn one to your local BMW dealer, where you would be inserted into a 3 Series coupe and all was good with the world. Then things changed. The 3 Series grew up a bit and, like that friend of yours who was the life and soul of the party but these days just chases around after his kids making sure they don't spill their Fruit Shoots, lost a bit of its joie de vivre in the change to 4 Series guise. Fortunately, its madcap little brother, the 1 Series Coupe, was still bringing the fun. That car was replaced by the 2 Series Coupe in 2014, a car that's been significantly updated since. The key changes began late in 2015 when a flagship M2 high performance version was announced boasting 370bhp from its 3.0-litre six cylinder petrol powerplant. Then, in the early Summer of 2016, BMW announced an all-new 340bhp TwinPower 3.0-litre straight six petrol unit with 14bhp and 50Nm more grunt than its predecessor, this inserted beneath the bonnet of an M240i variant that replaced the previous M235i model. At the same time, a highly efficient new Baukasten 2.0-litre four-cylinder engine was added to the lesser 184bhp 220i model, while the 245bhp 228i derivative used the same unit in its evolution to 252bhp 230i status. In the early Summer of 2017, the Bavarian brand built on these changes with styling updates, both inside and out. Rather encouragingly, BMW has given the 2 Series line-up a serious dose of engine in recent times. Even the entry level models aren't going to hang around. Drive on all models is directed to the back wheels and you get to choose between a six-speed manual gearbox or the quite brilliant eight-speed ZF automatic transmission. Diesel options include the 150bhp 218d, the 190bhp 220d and the 224bhp 225d. The 220d diesel variant will be the most popular of the trio, serving up a tall stack of torque, with 380Nm available from just 1,750rpm. The key recent developments though, have centred around changes to the petrol line-up thanks to a new Baukasten 2.0-litre four-cylinder engine and a revised 3.0-litre straight six. The base 220i 2.0-litre variant develops the same 184bhp output as before but is more efficient. Further up the range, the same unit is used in a more powerful 252bhp state of tune by a 230i model that gets to 62mph in just 5.8s. Pride of place though, goes to the six cylinder petrol versions, the M240i these days offers 340bhp, while the fearsome M2 fronts up with 370bhp. Even the M240i variant is very quick indeed. If you specify it with the eight speed automatic transmission, it'll get to 62mph in a mere 4.6 seconds. Press the Sport button and you'll immediately notice the steering weight up and the throttle response sharpen. Press the button once more and you'll find Sport+, which partially disengages the stability control and offers an even spikier throttle pedal. The chassis balance is a good deal more benign than the occasionally malevolent old 1 Series Coupe and it's a better driver as a result. Expect to be mercilessly harassed by these cars on foreseeable UK track days. The 2 Series coupe has always been a very cohesive piece of penmanship and that effect has been further improved by recent styling changes. Exterior updates include piercing LED headlights that come as standard, complete with hallmark four corona ring LED daytime running lights. All models gain enlarged kidney grilles with a more prominent chrome surround. In addition, all standard range variants get LED front fog lights as standard and offer a re-designed front bumper with a smarter air-intake design. At the rear, smarter LED tail lights with redesigned LED light bars now feature, while 'Sport' models get a re-styled bumper with sculpted design and high-gloss black trim. As for the interior updates, well, there's a re-designed instrument panel, plus a smarter centre console with a sliding cup holder cover and pearl chrome accents. On M Sport and M240i models, the instrument cluster features a Black Optic display with 3D effect dials - an option with other variants in the line-up. BMW's much-improved iDrive system features and delivers the latest-generation iDrive software on the standard BMW Navigation and BMW Professional Navigation set-ups. The large 8.8-inch screen on the latter navigation system is also equipped with BMW Touch Control for the first time, offering drivers the choice of iDrive with Touch pad, voice control and touchscreen to interact with the system. Practicalities remain as before. Rear seat space isn't bad for a smal coupe and the boot is a useful 390-litres in size. It's slightly odd that a car that looks so instantly a winning proposition comes with so few direct rivals. What else is there that offers this sort of punchiness, in a coupe body that sends drive to the rear wheels? Nissan's 370Z is a bigger, heavier thing, the Toyota GT 86 and Subaru BRZ twins more delicate and without the same options the throttle pedal in the 2 Series will afford. Prices are quite reasonable, with the 218i starting at just under £24,000 which is similar to the amount required for a rival Toyota GT 86 but the BMW features much greater torque fitted as standard. Trims run through SE, Sport and M Sport. BMW wants well over £35,000 for the M240i, but that still makes it one of the better performance car bargains. An M2 isn't, costing the best part of £45,000. We think an M240i is all you really need. Equipment here runs to a Nevada leather interior, both AUX-in and USB as well as a stereo that can play MP3s from CD, a multifunction steering wheel with a speed limiter mode, air conditioning, door sill finishers with M240i designation, a short-shift gear lever and a whole host of safety kit including DSC+ stability control, xenon headlights, a tyre pressure warning system and dynamic brake lights. That excellent ZF eight-speed automatic gearbox is offered as an option. It's hard to argue with BMW's efficiency measures, the latest Baukasten 2.0-litre petrol powerplant enabling the 220i to record 47.1mpg on the combined cycle and 138g/km emissions. Opt for the eight-speed automatic and those figures improve to 48.7mpg and 133g/km. Go for the 220d diesel and you'll see 65.7mpg and 112g/km with the manual transmission. The 230i petrol variant manages 47.9mpg and 134g/km in auto form. Those are quite some numbers from a vehicle that can still justifiably wear a performance coupe tag. The M240i also records some impressive efficiency data. It'll squeeze 39.8 miles from a gallon and will emit just 163g/km in auto form. EfficientDynamics, BMW's suite of energy-saving features, is responsible for making those vaguely implausible looking figures. The 2 Series is fitted as standard with an Auto Start-Stop function available on both manual and automatic transmissions. An ECO PRO mode, activated using the Drive Performance Control, is a new feature on BMW's that adjusts various on-board systems to maximise efficiency. When in ECO PRO mode, the throttle response is adjusted to encourage a more economical driving style. The extra economy created in ECO PRO mode is fed back to the driver, with the in-car displays showing the additional number of miles achieved. BMW used to be a company with an unerring ability to zero in on the bullseye. That was fairly easy when your range consisted of 3, 5, 6 and 7 Series cars. Today though, the brand has its 1, 2, and 4 Series models, plus X1, X3, X5, X6 and Z4 series cars, as well as the various Gran Coupe and Active Tourer options. The range has ballooned and the quality in depth is inevitably a little more variable. There are some great cars and some not so brilliant model lines. This 2 Series Coupe might well be right near the top of the tree. It's an inspired piece of product development and it's just been executed so well. Compact proportions, low weight and good performance were the design parameters for this car and BMW has nailed all three. If you feel the 3 Series coupe - and latterly its 4 Series replacement - is a car that no longer knows how to let its hair down, this Munich maker has just the answer in its fun-size sibling.